I would love to say that we stick to basic, old-school, birthdays in our household. In a way, we do. I mean, I have yet to shell out $1,500 to let Carlitos sleep over at a museum with friends and we certainly have never rented a pony or anything. But, I also don’t necessarily stick to cone hats and balloons. Yes, we usually just have it in our home, but I do still tend to go a little overboard. A teeny bit. Sometimes. Okay, okay, I totally give each food item a “Themed Title.” Railroad Tracks (pretzels) or Safari Salad (uh, salad) anyone? 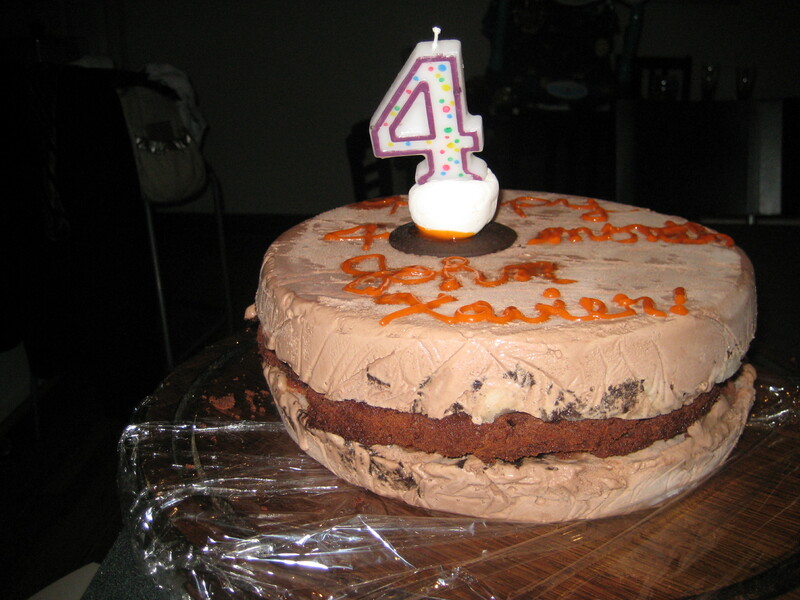 In any event, we just celebrated Xavi’s 4 month birthday, which included the most delicious cake I have ever created. It was my first ice cream cake. I’m in love. We ate the whole thing in two days. Just the three of us. Yes, even my ice cream hatin’ husband totally snuck a big slice one night after I was in bed. This has NEVER happened before. I usually have a hard time forcing him to eat even a bite of any dessert. And this magical cake inspired Carlitos to make up a Haiku. I kid you not, I overheard him say these words while eating his cake. I thought the rhythm sounded familiar, so I counted out the syllables and sure enough, my son had spoken his first Haiku. 1. My son has a future in poetry. 3. I can NOT be left in a home that has ice cream cake in the freezer with no other adult supervision. My weakness is still enormously greater than my husband’s. I succumbed. The cake disappeared. This entry was posted in Real: my personal trials, tribulations and tales and tagged birthdays, cake, delicious. Bookmark the permalink. Follow any comments here with the RSS feed for this post. Post a comment or leave a trackback: Trackback URL.